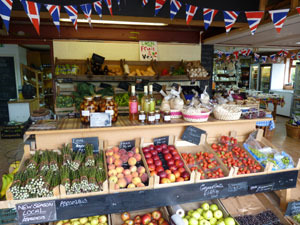 This traditional farm shop recently featured in BBC Countryfile & Bill’s Tasty Weekends. We sell fruit & vegetables, dairy products, sausages & pies & stock local honey, beer & cider & produce preserves & home-baked goodies. Traditional farm shop and tearoom supporting local growers and independent food producers. We sell seasonal fruit and vegetables, dairy products, sausages and pies. The shop also stocks local honey, beer and cider. We also produce our own range of preserves and home-baked goodies. Flowers and plants are available along with made to order food hampers. The farm shop recently featured in BBC Countryfile and Bill’s Tasty Weekends.